What is Swank Digital Campus? Swank Digital Campus, Inc.® allows Goshen College faculty, students, and staff the ability to legally stream major motion pictures and documentaries via a url link. Faculty may link the movie in Moodle and have students view the film at their convenience or show during class. Browse the Swank Digital catalog. How long do I have access to the film?. Does my department have to pay anything for this service / does it come out of our library allocation? What is the intended purpose of this service? Because of the expense (each rental costs $75), we are asking that you use these films if they meet the curricular needs for a class. It is NOT intended for research or personal purposes. Films can be shown in a classroom setting. They can NOT be screened in venues that are open to the public. Students can be given a link that will allow them to watch the films on their own devices on their own time. Search Swank Digital to see if they have rights to the film you would like to stream. Swank Digital works on all browsers, mobile devices, and iPads, however some Firefox users have reported issues. Mobile devices and iPads need the Swank Media Player app. If you are having problems getting Swank Digital to work, contact library technical services (librarytechservices@goshen.edu) or call the Library at 574-535-7427. Each film has the option to turn on captions. Follow these steps to add your title in Moodle. 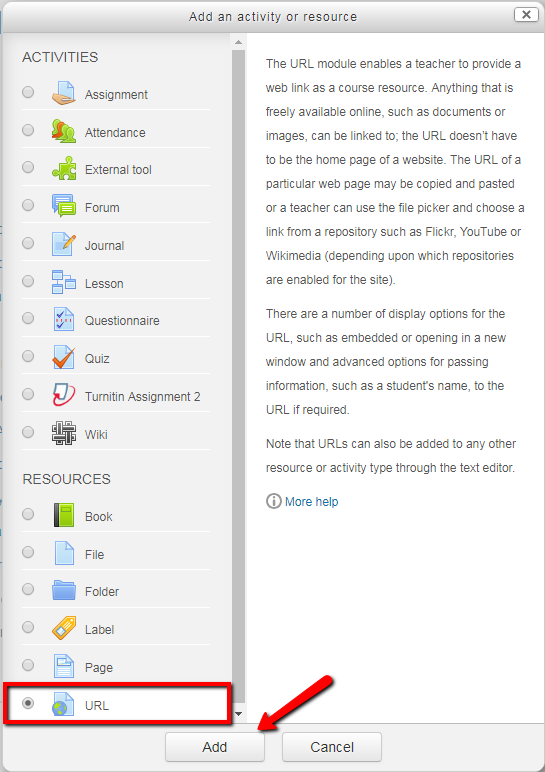 In your Moodle course, turn editing on and click on "Add an activity or resource." Select URL as the activity type. Add in the name of the film, the external URL, and a description. If you want the description to display for your students to see, be sure to check the box to display the description. Hit Save and return to course.